US corn and wheat stockpiles shrank far more than expected this summer, the government reported on Friday, reigniting a rally in grain prices on fears that strong demand and drought-decimated crops will keep markets tight. Corn futures surged nearly 6 per cent on the Chicago Board of Trade after the US Department of Agriculture reported corn stocks on September 1 were below 1 billion bushels for the first time in eight years. Wheat futures rose more than 5 per cent, topping $9 a bushel after the data showed stockpiles were 7 per cent less than forecast. The ending-stock figures showed that record-high corn prices during the quarter had failed to put as big a dent in demand as analysts expected, suggesting that prices may need to rise higher still in the coming months to ration demand amid heightened competition for food, livestock feed and ethanol. The data are likely to revive global concerns over rising food prices and supply security, and may renew calls to ease the US ethanol mandate that many blame for driving up prices. While consumers have been bracing for higher prices after the worst US drought in half a century withered corn and soybean crops this summer, Friday's data shows the margin of error in supplies is even thinner than many feared. "We may be getting down to the rind of the watermelon on the corn and wheat," said Jim Gerlach, A/C Trading in Fowler, Indiana. After weeks of easing prices, the tide may be changing, he said: "Personally, I'm moving toward a buy weakness opposed to selling strength." USDA's survey of farmers and warehouses showed 988 million bushels of corn on hand -- 11 per cent less than expected -- on September 1. That date is the start of the corn marketing year and the traditional low point for supplies, as it comes before this year's harvest gets added to the stockpiles. 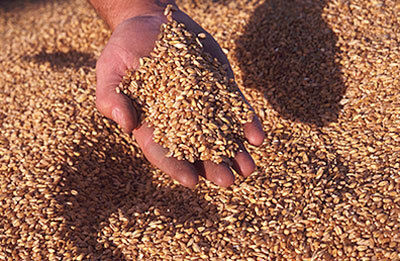 Wheat stocks of 2.1 billion bushels were 7 per cent smaller than traders expected. Soybean stocks were much larger than expected. It was the third straight year that the USDA's September inventory report surprised traders. The unexpectedly low corn number is all the more shocking as many analysts were bracing for a higher figure, artificially inflated by the unusually early harvest that is bringing "new crop" supply into inventories. But supplies shrank. Even with corn prices soaring to $8 per bushel earlier this year, demand remained heavy from exporters, livestock farmers, ethanol plants and food makers. Corn consumption from June-August was 15 per cent smaller than the same period a year ago, yet not enough to prevent low stocks. USDA chief economist Joe Glauber said the corn and wheat stocks figures showed demand was larger than expected, especially for livestock feed. "We're going to hear talk that we're going to have to do a better job of rationing in the feed sector. That's not easy to do," said Don Roose, president of U.S. Commodities. Corn futures were limit up -- at the daily ceiling -- at $7.56-1/2 a bushel in Chicago at midday. "Synthetic" bids, from the options market, indicated corn was worth up to $7.60 a bushel. Wheat futures ended the day at $8.99-1/2 a bushel, up 5 per cent. Soybeans closed at $15.98, up 1.7 per cent. Wheat consumption was up by 27 per cent for June-August compared to one year ago, USDA said. Agricultural economist Darrel Good of the University of Illinois estimated 435 million bushels of wheat, twice the usual amount, was fed to livestock in the three-month period.